Many Saints receive graces given freely by God, what theologians call gratiae gratis datae. These supernatural gifts require the direct and extraordinary intervention of God in a miraculous way. They include, for example, the gifts of healing, the working of miracles, prophecy, the discernment of spirits, the gift of tongues or interpretation of tongues. These gifts are normally called charismas. Because we read about such gifts in the lives of the Saints, we can often assume that if a person has them, he or she is holy, even a saint. I imagine many readers will be surprised to learn that this is not necessarily so. Such gifts are not always given on account of the merit or virtue of the person who receives them. In fact, they can even be granted to one who lacks sanctifying grace. St. Francis of Assisi could recognize when such gifts were not a sign of holiness. There was a certain brother, for example, who appeared to be a great saint, with many exterior signs of holiness. He had, however, singular habits. For example, he observed silence so strictly he would only confess by signs instead of words. 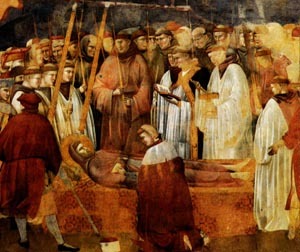 The Brothers all praised him highly, but St. Francis would not praise what he called “fraudulent deception.” In fact, before long the Brother left the Order, proving the Saint’s discernment of spirit. The Devil can also work some types of signs and wonders. He, of course, cannot work any action that relies on the supernatural, because he is an enemy of God. But the Fallen Angel still has angelic powers - preternatural powers - that can perform prodigious feats which far exceed the power or knowledge of human beings. 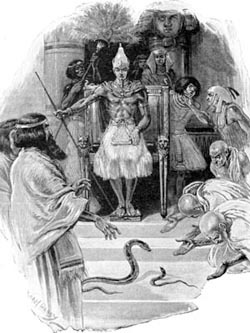 When Moses went before the Pharaoh and worked miracles to impress him so that he would free the Chosen People from captivity, many of his miracles were imitated by similar actions of the pagan Egyptian priests. They were able to work these acts through the preternatural powers the Devil shared with them. The Devil can also transport bodies with great rapidity, as Satan did with Our Lord when he transported Him to the top of a high mountain and showed him all the kingdoms of the world (Mt 4:8). The Devil cannot prophecy per se, but because he knows so many things in their causes it can appear to human beings that what was predicted was a true prophecy. Also, the Devil cannot know the secrets of a person’s mind and heart - as only God knows this - but because he can so keenly analyze the temperament and character of individuals as well as circumstances of their life, he can seem to read the soul of a person. Let’s look at a famous example of how Satan produced what were taken as signs and wonders in a Franciscan nun in Cordoba, Spain. 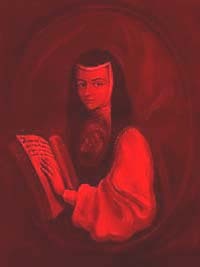 For 39 years Sister Magdalena de la Cruz (1487-1560) was honored as a mystic and one who received the stigmata. She used to fall into trances, have visions, and make prophecies. She had quite a following, including many religious. St. Ignatius Loyola, however, always regarded her with suspicion, as did Blessed Juan de Avila, the spiritual director of St. Teresa of Avila. In 1543, believing she was on her deathbed, she made a full confession, acknowledging that since age 12 she had entered into a pact with Satan and operated for 50 years under the influence of help of two devils named Balbant and Patorrio, her paramours and instructors. They were the ones who had impressed on her the signs of bleeding wounds for 39 years. Because of the visions, healings and speaking in tongues that proliferate in our days, I think it is important for Catholics to know what the Church teaches on this topic. Then, perhaps, we will not be so prone to follow the latest new visionary or prophet. We should exercise extreme caution in such matters – it is better even to err on the side of doubt than to believe too readily in something that could be inspired by the Devil. 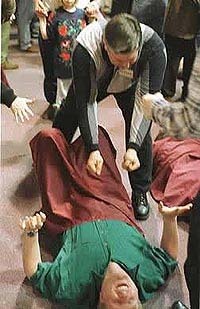 Pentecostalists who are "slain in the spirit" experience preternatural "healings"
1. Produce visions that are actually seen, or imaginative visions. 3. Produce rays of light in the body and sensible heat. 4. Cause feelings of consolation and tenderness. 5. Instantaneously cure strange sicknesses that were caused by diabolical influence. Tertullian wryly notes that these were not authentic sicknesses in the first place, and the Devil really doesn’t cure – he just ceases to torment the individual. This is why even miracles worked in the causes of Saints had to be so carefully examined. 6. Produce the stigmata, as well as other kind of bodily extraordinary phenomena or objects such as crowns, rings, etc. 7. Simulate miracles and other phenomena such as levitation and bi-location. 8. Cause persons or objects to disappear from sight (by placing an obstacle in the line of vision or acting directly on the sense of sight). 9. Simulate locutions by means of sound waves or immediate action on the sense of hearing. 10. Produce body incombustibility by interposing some medium between the fire and the body of the individual. For example, there are documented cases of spontaneous human combustion, where a person bursts into flame for no apparent reason. The flames, very hot and localized, usually destroy most of the body but leave objects in close proximity to the person relatively unburned. Persons without faith are confounded by such incidents. The Catholic understands that this action falls within the powers of the Devil. The general rule of the Church with regard to extraordinary phenomenon used to be: Be extremely vigilant in matters of extraordinary phenomena. Since Satan is capable of producing visions, ecstasies, stigmata, and any number of phenomena, the Church used to employ a long, arduous process to determine authenticity. Many Catholics today jump on the bandwagon of any person who has a vision or effects a so-called “healing” – so common at charismatic functions. Others ask God for visions and healing powers for themselves, thinking that this is a sign of holiness and God’s favor. It is not a wise thing to do, and the Church used to caution against this. Before Vatican II, the Church always taught that great vigilance should be shown in these matters. Religion teachers used to counsel us to never, never ask for supernatural gifts: First, because it was for God to choose to whom He gives these gifts; and second, because in our vainglory to display special gifts, we could well be inviting Satan to make some preternatural action. The wise course regarding signs and wonders is to avoid the two extremes: either to see every unusual phenomenon as supernatural or miraculous or to refuse to recognize anything but the natural in reality. 1. Antonio Royo Marin, OP, The Theology of Christian Perfection (NY: Foundation for a Christian Civilization, 1987), pp. 565-566.